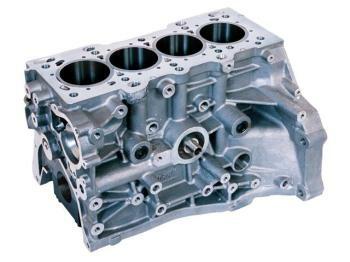 The Dart Honda block is offered in two versions that replace B18 and B20 castings. Both are built to withstand the extreme cylinder pressures created by turbochargers and nitrous oxide injection. We increased wall thickness in all critical areas and beefed up the bottom end with steel main bearing caps. Best of all, Dart blocks are compatible with production Honda cylnder heads, internal components and accessories. Premium alloy: Dart aluminum blocks use 355-T61 aerospace alloy for superior strength and integrity. Replaceable ductile iron dry sleeves are fully supported to reduce bore distortion and enhance ring seal. Closed deck design and strengthened main webs increase rigidity and improves head gasket sealing. Steel main caps with high strength bolts increase bottom end strength and minimize bearing bore distribution. Extra large water jackets enhance coolant circulation around cylinder barrles. Machined for piston oil sprayers (not included) to reduce piston temperatures and prevent detonation. Uses stock components, including oil pan, oil pump, water pump, alternator and timing belt tensioner. Precision CNC machining ensures consistent high quality and eliminates expensive “blueprinting”.